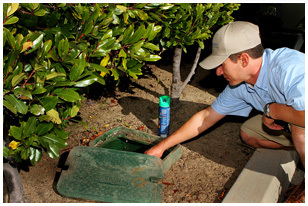 Irrigation lines are everywhere… yard sprinklers, golf courses and commercial agriculture areas are the most common. The amount of lost or wasted water can be extremely expensive. These leaks are very difficult to find since they can run anywhere from a few feet long to several thousand feet. Pinpoint Leak Detection has developed several unique techniques to isolate the problem and accomplish this task easily with pinpoint accuracy.